In her two previous books about the Brontës' Brussels - Down the Belliard Steps and The Brontës in Brussels - Helen MacEwan described both beautifully and thoroughly the now-gone Brussels the Brontës knew(1). She explored the places the Brontës would have been familiar with. Those two books were about Charlotte and Emily too coming to live for a time in Brussels and what they encountered there. But what about the other way around? What about the Belgian interpretation of what they saw and wrote about? Except for a few devoirs, Emily's legacy about her time in Brussels is virtually non-existent. But for Charlotte it was a key period, which left a mark on her both personally and professionally. She wrote about Brussels on those two levels as well - private letters from there sent to family and friends and descriptions, settings and even people in her novels. The Professor and Villette both are thinly-disguised Brussels novels. And Shirley, too, has a pair of Belgian brothers. Much of what she wrote has been found spiteful or deemed untrue, but is that so? Helen MacEwan researched Brussels in the time of the Brontës deeply and put Charlotte's statements and descriptions to the test. And as it turned out, though certainly tinged by her own experience and used for fictional purposes in the case of the Belgian novels, much of what she wrote coincides with what others wrote at the same time (or very nearly so). As it turns out, Villette especially is an important document when it comes to seeing how life was shortly after the Independence of Brussels in 1830. Charlotte Brontë was there at a key period and her realistic descriptions of places and customs are valuable in the sense that they offer a wealth of information not otherwise recorded. Add to that the fact that she mostly moved around an area of the city that no longer exists and what she wrote is a testament to a long-gone time and place. For instance, there's hardly any record of how finishing schools at the time of Charlotte Brontë worked and thus her descriptions both in her letters and novels are quite relevant. A letter she wrote with Mary and Martha Taylor in which the Taylor sisters described their teachers at Koekelberg and the lessons they took there as well as the amount of foreign students is a treasure trove on the social history of Brussels, as are Charlotte's descriptions of lessons and fêtes in Villette. Charlotte was nothing if not observant and perceptive, especially given that she was in a foreign country for the first time in her life and everything she encountered was new. And although she once famously claimed that she suffered 'reality to suggest, never to dictate', it is pretty clear that she's mostly reliable when it comes to descriptions of places and events. In fact, Belgian researchers have been able to find out the exact date on which she attended a concert - which she later incorporated into Villette - during which she saw King Leopold I and the exact events (a mixture of two close events, actually) which she so craftily used for her hallucinogenic scene in the park in Villette. It has also been possible to identify the paintings she saw and also incorporated into Villette. Thus proving not only her reliability as a witness but also the richness of her art and how skilful she was when it came to craft a story. Her descriptions of Brussels, its customs and its people (generally speaking at least) have been considered bitter, contaminated by the inner turmoil she was going through and her incapability of blending into the social life of the place. But we see others such as Baudelaire or Victor Hugo as well as many others comment on the very same things she mentions. Her accurate portrayal of the class system at the time, based both on location and language spoken is remarkable precisely because of how effortlessly and naturally it was woven into her fiction. For instance, she comments on how M. Paul observes the outside from the inside by using a mirror positioned strategically and as it turns out this was not an uncommon thing to do in Brussels at the time! 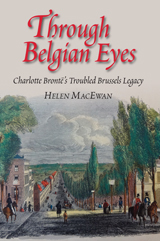 Thus, Helen MacEwan goes on to examine other aspects which stand out from Charlotte's view of Brussels and puts them against other testimonies from that time. Thus, she examines why Charlotte may have disguised Belgium as Labassecour (literally, 'the farmyard') or Brussels as Villette (literally, 'small town'), why she described the reigning Catholicism as she did (she was very critical particularly of how young girls were brought up in that faith - was she alone in her perception or was she not?). Helen MacEwan tells us that her description of the king of Labassecour, the equivalent of Leopold I, is 'of particular interest to Belgian readers' and it seems that it was also pretty accurate from what we know about him. Thanks to Helen MacEwan we come across a couple of local Brontëites, which wrote about them in Brussels during the 20th century: journalist Louis Quiévreux and biographer Abbé Dimnet. Their views are enhanced by their knowledge of the Belgian character and the local geography. By the end of the book, we admit to having a soft spot for Louis Quiévreux, indefatigable Brontëite, who never missed an opportunity of celebrating, defending or reclaiming them. He was particularly active in his campaigns both against the destruction of the Brussels they knew - the Quartier Isabelle in general and the Pensionnat Heger in particular - and for the construction of some sort of tribute to the Brontës. He was adamant that Brontëites from all over the world would be travelling to Brussels in the future in the footsteps of the Brontës and would find no mention of them. (Which is what happens, of course). It broke our hearts to read that by the time the Brontë Society finally put a plaque close to the site where the Pensionnat would have been, he had been dead for ten years. Because we have an acute interest in Brontëana, we were delighted to find an article on Belgian Brontëana: the Brontë devoir L'ingratitude being a discovery for the whole world in 2012 except for the Musée Royal de Mariemont staff, who always knew it was there. Charlotte's juvenilia turning up in a market stall while M. Heger was still alive (it is thought that she gave him the stories) and, most moving of all, a book given by Charlotte to 4-year-old Louise Heger when she left Brussels and which is passed down the generations without its inscription, which was cheekily torn out by a Russian lady! Constantin Heger and his wife, as well as their children and their descendants, turn up all throughout the book. The characters of Monsieur and Madame Heger immortalised by Charlotte both in real life and in her novels are examined in the light of other contemporary testimonies which makes for a fascinating insight into the people who lived with Charlotte during her stays in Brussels. It is interesting, too, to see what became of their children and how the Brontë connection affected - or not - their lives and what they thought of the whole thing. We were particularly enchanted by an anecdote told towards the end of the book featuring Belgian novelist Marie Gevers, the Belgian Congo, the centenary of Charlotte's death, Brontë juvenilia and a descendant of the Hegers. All in all, the book is a perfect companion to Charlotte's stay in Brussels and her fictional portraits of it. It puts some unfounded myths to rest and gives a picture not only of the context that welcomed Charlotte in Brussels but also of how said context may or may not have been affected by her stay and her words. As Helen MacEwan has tried to make us see before, for Charlotte Brussels was more than just an educative stay in the continent - it was definitely a life-changing event that should be approached with depth and understanding. The book, as always with Helen MacEwan's books is full of plates and illustrations to help the reader, and, in spite of the wealth of information conveyed in it, it is an easy, entertaining, compelling read. (1) Helen Macewan is also the author of a biography of Brontë biographer Winifred Gérin.